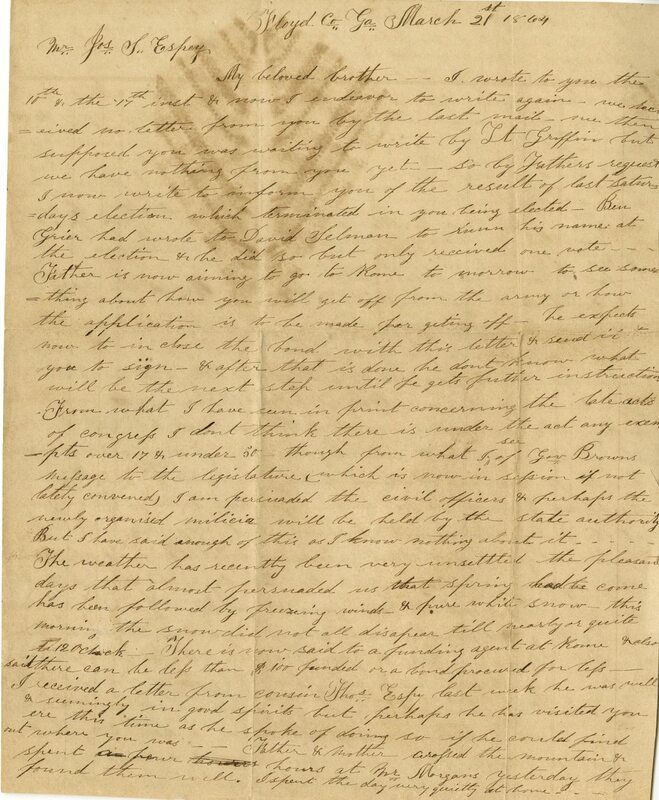 Item Description: Letter dated 21 March 1864 from Maggie Espey to her brother, Joseph Espey. In it, Maggie discusses Joseph’s victory in a local election, potentially getting him excused from his military duty as a result, the weather, her parents’ activities, and the leaving of slaves to join the Union. Joseph S. Espey, a member of Company D, 65th Georgia Volunteers stationed mainly in Tennessee and Georgia, was the son of Joseph and Jane Espey. Item Citation: Folder 3, Joseph Espey Papers, #03349-z, Southern Historical Collection, Wilson Library, University of North Carolina at Chapel Hill. My beloved brother — I wrote to you the 10th & the 17th inst and now I endeavor to write again. We received no letter from you by the last mail. We then supposed you was waiting to write by Lt Griffin but we have nothing from you yet, So by Father’s request I now write to inform you of the result of last Saturday’s election which terminated in you being elected. Ben Grier had wrote to David Selman to ? his name at the election and he did so but only received one vote… Father is now aiming to go to Rome tomorrow to see something about how you will get off from the army or how the application is to be made for getting off. He expects now to in close the bond with this letter and send it to you to sign, and after that is done he don’t know what will be the next step until he gets further instructions. From what I have seen in print concerning the ?acts of congress I don’t think there is under the act any exempts over 17 and under 50 though from what I see of Gov Browns message to the legislature which is now in session if not lately convened, I am persuaded the civil officers and perhaps the newly organized militia will be held by the state authority. But I have said enough of this as I know nothing about it……. 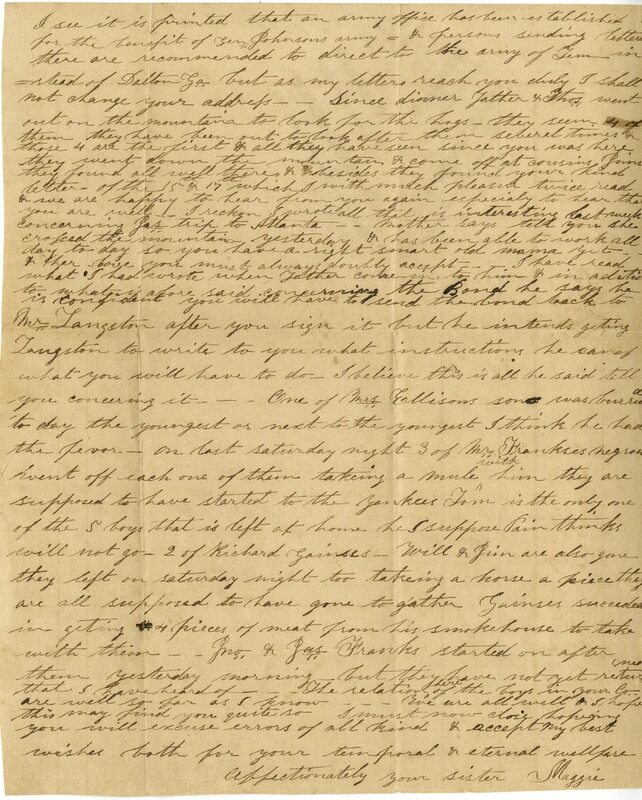 I see it is printed that an army office has been established for the benefit of Gen Johnson’s army and persons sending letters there are recommended to direct to the army of Tenn instead of Dalton Ga but as my letters reach you duly I shall not change your address _ _ Since dinner Father and ? went out on the mountain to look for the hogs, they seen 4 of them they have been out to look after them several times and those 4 are the first and all they have seen since you was here. They went down the mountain and come off at coursing ? they found all well there and besides they found your kind letter of the 15 and 17 which I with much pleased twice read and we are happy to hear from you again especially to hear that you are well. I reckon I wrote all that is interesting last week concerning gas trip to Atlanta_ _ Mother says tell you she crossed the mountain yesterday and has been able to work all day to day so you have a right smart old mama yet_ _ and her love you must always doubly accept.. I have read what I had wrote when Father came in, to him and in adition to what is aforesaid concerning the Bond he says he is confident you will have to send the bond backt o Mr. Langston after you sign it but he intends getting Langston to write to you what instructions he can of what you will have to do. I believe this is all he said tell you concerning it _ _ _ One of Mrs. Ellisons sons was here to day the youngest or next to the youngest I think he had the fever_ on that Saturday night 3 of Mrs. Frankses negroes went off each one of them taking a mule with him they are supposed to have started to the Yankees Tom is the only one of the 5 boys that is left at home he I suppose ? thinks will not go. 2 of Richard Gainses_ Will and Jim are also gone they left on Saturday night too taking a horse a piece they are all supposed to have gone together Gainses succeeded in getting 4 pieces of meat from his smokehouse to take with them _ _ _Mr and Mrs Franks started on after them yesterday morning but they have not yet returned that I have heard of_ _ _ The relation here of the boys in your Co. are well so far as I know_ _ _ Eve are all well and I hope this will find you quite so. I must now close hoping you will excuse errors of all kinds and accept my best wishes both for your temporal and eternal welfare. This entry was posted in Southern Historical Collection and tagged elections, local militia, Rome (G.A. ), slaves, weather. Bookmark the permalink.